Desjardins said the club provides a structured environment for students and offers countless activities and programs along with summer camp. When not at the office, Desjardins can be found roaming the halls of the club working on projects and assisting staff. He recently installed a video security system in the building, practically sleeping in the club. And his passion for serving the community can also be seen in the operation of Daisy Cleaners. Desjardins offers free cleaning services to community groups, churches, PTAs, Play Among the Stars, and countless others. The business is also certified eco friendly by the Green Business Bureau, meaning the cleaning practices are better for the environment and the customer. Desjardins said the process wasn’t easy, requiring replacement of major cleaning equipment and nearly a $200,000 investment. 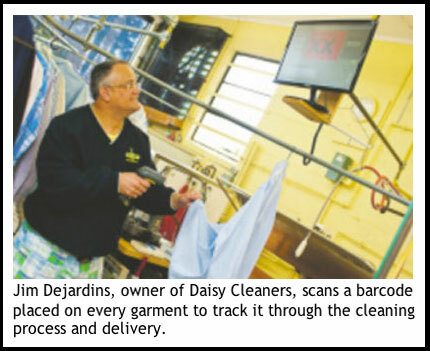 Complementary pickup and delivery service is also provided to the community, as Desjardins sought a way to simplify the dry cleaning experience. 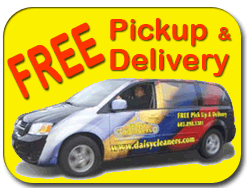 Twice a week, the Daisy van will come to an area home or business delivering cleaned laundry and receiving items to be cleaned. This also allows the company to plan its workload and function more efficiently. Extensive technology allows Daisy to offer exceptional service. Each item receives a small barcode and its tracked through the cleaning process. Desjardins said items are scanned before each process and tracked through the store. ‘We utilize technology to the extreme,” he said. Tracking allow the company to easily retrieve items and plan efficient driving routes. Being located in the depot, Desjardins has served on the depot redevelopment committee for the Town of Salem, working to improve traffic flow in the area. 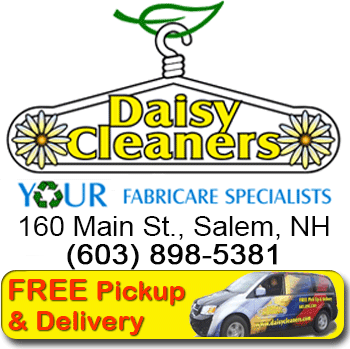 He is also a member of the Greater Salem Chamber of Commerce Development Committee, and past president of the Northeast Fabricare Association. Formally a concord resident, Dejardins only moved to Salem about six years ago, but immediately sought to serve his home. “When the community does better, my business does better,” he said. Next year, Desjardins hopes to raise more money for the Boys and Girls Club and has begun planning his auction item donation.